Kannur University was established in 1996 and located in Kannur, Kerala, India. 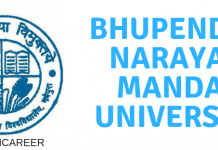 The university is accredited by NAAC with ‘B’ grade. The objective of the Kannur University was to establish in the state of Kerala a teaching, residential and affiliating University, promoting the development of higher education in Kasargod and Kannur revenue districts and the Mananthavady Taluk of Wayanad District. Kannur University is a multi-campus university, at Kannur, Kasargod, Mananthavady, Payyannur, Thalassery, and Kanhangad. The tentative date of the application form filling, last date of the application form submission without late fee and last date of the application form submission with late fee is given below in the table. The candidates seeking admission to the courses offered by the university may check eligibility criteria and fill the Application form accordingly. B. A English Pass in Pre-Degree / Plus Two or Examination Equivalent thereto. B. A History Pass in Pre-Degree / Plus Two or Examination Equivalent thereto. B. A Economics Pass in Pre-Degree / Plus Two or Examination Equivalent thereto. B. A Malayalam Pass in Pre-Degree / Plus Two or Examination Equivalent thereto. B. A Political Science Pass in Pre-Degree / Plus Two or Examination Equivalent thereto. B.B.A Pass in Pre-Degree /Plus Two or Examination Equivalent thereto with a minimum of 45% marks for NonCommerce students and pass for Commerce students. B.C.A A pass in Higher Secondary Examination of the state or an Examination accepted by the University as equivalent thereto with Mathematics or Computer Science or Computer Application or Informatics Practices as one of the optional subjects. B. Sc Mathematics Pass in Pre-Degree /Plus Two or Examination Equivalent thereto with Mathematics as one of the subjects. B. Com (Co-operation)/ Additional Optional (Cooperation) Pass in Pre-Degree /Plus Two or Examination Equivalent thereto with a minimum of 45% marks for NonCommerce students and pass for Commerce students. * Eligibility / Equivalency Certificate issued by Kannur University shall be submitted along with the application in the case of courses other than HSE of Kerala / SSE of CBSE and ICSE. Pass in B. Sc (Mathematics / Statistics) with CGPA 2.8 or CGPA 3.00 (2008 Admission) in Part III. M. A History Grading: Pass in B. A History with CGPA 1.5 or CGPA 2.00 (2008 Admission) in Part III. Non Grading: Pass in B. A. History with a minimum of 45% marks in Part III main (excluding subsidiaries). M. A English Grading: Pass in B. A English or Functional English with CGPA 1.5 or CGPA 2.00 (2008 Admission) in Part III. Pass in BA / B Sc with SGPA 1.5 in Part I English with three papers. M. Com Grading: Pass in B.Com / B.B.A / B.B.M / BBS with CGPA 1.5 or CGPA 2.00(2008 Admission) in Part III. Non Grading: Pass in B.Com / B.B.A / B.B.M / B.B.S equivalent Degree with not less than 45% marks in Part III. M. Sc Mathematics Grading: Pass in B. Sc (Mathematics) with CGPA 1. 5 or CGPA 2.00 (2008 Admission) in Part III. Non Grading: Pass in B. Sc Mathematics with a minimum of 50% marks in Part III main (excluding subsidiaries). Afzal-Ul-Ulama (Preliminary) Pass in S.S.L.C or Examination Equivalent thereto. The Application form shall be available on the university website: www.sde.kannuruniversity.ac.in from last week of August 2019. The candidate can submit the application after remitting the admission fee. By Chalan in Treasury [Head of Account 8658-00-102-96(27) KUS] or in SBI [Head of Account 109-010]. Online payment through ‘SBI Collect’ (link available in the University Website). DD in favour of Finance Officer, payable at SBI, Kannur University Campus Branch(Thavakkara) (only for applicants outside Kerala). Visit the above mentioned website of the university. Enter your full name in BLOCK letters. Upload a recent passport size photograph in the application form and the same photo to be attached with the print out of the application. Click ‘Register’ button only after verifying all details provided in the application. Take print out of the application form and it is to be submitted to the University with all necessary documents on or before the last date. The candidate’s photograph printed in the application form is to be attested by a Gazetted Officer. Equivalency / Eligibility certificate issued by Kannur University is to produce in the case of courses other than HSC /SSE/CBSE and ICSE. Community Certificate in the case of candidates who claim relaxation in minimum marks prescribed for admission. Certificate of cancellation of registration in the case of candidates who registered for another degree programme under this University / Other Universities/ Institutions and thereafter discontinued the programme. One passport size photograph (same Photo which is uploaded in the application) and following documents. * those who have passed the qualifying Examination other than the Courses mentioned above are required to produce Eligibility / Equivalency Certificate of Kannur University. The application with all documents shall reach the office of the Director, School of Distance Education, Kannur University, Thavakkara, Civil Station – 670002 on or before the date prescribed for the closing of the online registration. Additional Degree: Candidates who have qualified the graduate course/programme of Kannur University or other University shall be permitted to appear for another graduate programme provided he/she has undergone the prescribed programme for a period of not less than two academic years through the School of Distance Education by doing all the courses/papers of the programme. Additional PG Degree: Candidates who have been awarded M Sc / MA Degree of Kannur University or other University which recognized is as equivalent to the Degree of Kannur University shall be permitted to appear another MA previous and final year Examinations subject to undergoing a further Course of study for a period of not less than two academic years through the School of Distance Education.